1. What makes Sound Percussion unique? Each book can be used independently to focus on a particular instrument or in any combination up to a full percussion ensemble. The method is based on a clear progression of notes, rhythms, and skills. Includes access to correlating SI Online media. Perfect for teachers who are non-percussion specialists. Teachers can work sequentially or jump from section to section to address specific needs. Features professional-level demonstrations with a full percussion ensemble. Select lines include demonstrations with only mallet percussion and timpani to provide interactive practice opportunities. 2. Is Sound Percussion a replacement for the Sound Innovations, Book 1 percussion books? No, Sound Percussion does not replace your standard SI Book 1. 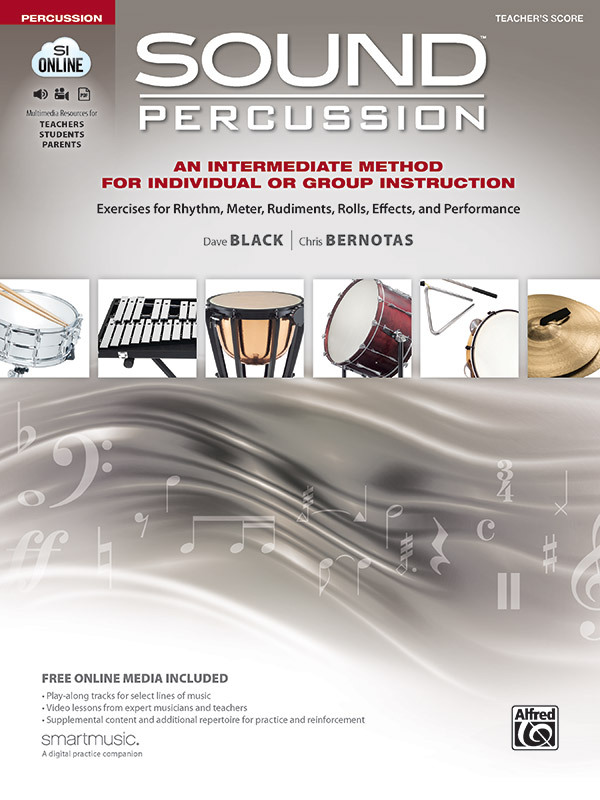 However, it can work as a companion or supplement to it or any other beginning band method book, providing support to your percussion students’ development. Since every band and program is different, the application of the curriculum may vary widely. 3. Does Sound Percussion correlated to Sound Innovations, Book 1? Sound Percussion is an independent method that is not intended to correlate directly with SI Book 1. The pacing of band methods is often based upon the wind instrument development. As a stand-alone method, Sound Percussion allows the teacher to set the speed of the curriculum based upon the percussion students’ needs. 4. How does the pacing of Sound Percussion differ from that of a standard band method? Because Sound Percussion is not correlated with a wind band method, the pacing is callibrated with the percussion student in mind. In particular, mallet notes are introduced at a slower pace with more reinforcement than a standard band method. 5. The books are labeled "Intermediate"—is Sound Percussion appropriate for beginning percussion students? If so, how much of the book is at the beginning level? You can, and perhaps should, use Sound Percussion with your beginning students. It begins with an introduction of the instruments and grips, and progresses to an intermediate level. The book is considered “Intermediate” because, while it starts with the basics, students will quickly be introduced to intermediate-level skills. 6. Can Sound Percussion be used as a go-to method for individual snare drum or mallet studies? Absolutely! Focusing all students on the development of snare drum and mallet skills will help transfer the development of skills to all the other percussion instruments. We recommend all students purchase those two books and suggest that schools purchase classroom sets of both the accessory percussion and timpani books. 7. Can Sound Percussion be used as a curriculum for pull-out percussion lessons? Yes! Lessons using Sound Percussion can focus on any single instrument with all students or in any combination. You have the flexibility to plan and teach the skills appropriate for your students. Sound Percussion was designed with group lessons in mind so that students can learn all the skills they need to be well-rounded percussionists on every instrument. Students will also get experience with the independent playing responsibilities that comes with playing in a percussion section or percussion ensemble. 8. Can Sound Percussion be used as a curriculum for individual study? Absolutely! Each book helps develop student skills as independent percussionists. Again, you can use the resources as you see fit. 9. Why is the book grouped by skill? Grouping the book by skill allows the teacher to design both the lessons and progression as they see fit, in order to meet the needs of their students. 10. How can Sound Percussion help the non-percussion teacher feel more confident about teaching percussion? By providing a clear explanation of skills (duple and triple rolls, multiple bounce and open rolls, dampening, accessory instrument technique, etc.) and step-by-step MasterClass video demonstrations in simple, uncomplicated language—non-percussion specialists will now be able to approach topics with confidence!